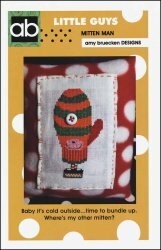 Little Guys: Mitten Man [J1066] - $6.00 : Yarn Tree, Your wholesale source for cross stitch supplies. This "Little Guy" has bundled up by wearing a very large orange and green mitten. He has on striped socks and is standing on a little box. Stitch count 35 x 63.